This article will focus on how the COMEX SILVER market reacted to Ben Bernake's Q and A last week, The SUPER-TREND, and Silver's Technical Support. Fundamentally, as Federal Chairman Ben Bernake announced last week that there were no plans for quantitative easing or "printing money" to add liquidity to the U.S. Economy back on February 29th, the Comex Silver market collapsed as much as $3 per ounce in a matter of minutes after being in a SUPER-TREND higher for a few days prior. I, as a series 3 commodities and futures broker for the last 14 years was totally baffled by the fact that this news would move Silver at all. With the Dow Jones pushing 13,000 and unemployment getting better, the economy is recovering, again at a slow pace. But I have recommended Silver to my clients for the last several weeks and never once did I say to buy Silver Bull Calls Spreads because there would another round of QE3. But yet when the FED said no QE3 the Silver fell as much as $3 per ounce?! I was really caught off guard by this one. The other reason the Silver market fell according to some other reports was because of profit taking. Now that I could stomach because Silver had rallied from a low of$26.56 per ounce on December 3rd to a high of $37.58 per ounce on February 29th, which is about an $11 per ounce move in about 2 months. So yea, I would have to believe that there were some profits to take, since with the leverage of a Silver Futures contract is 5,000 ounces of Silver, an $11 move would equal about $55,00 in around a two month span. Remember that leverage can work for you and against you AND options and futures do not move in tandem. (Note: the CFTC defines Leverage as the ability to control a large dollar amount of a commodity or security with a comparatively small amount of capital). 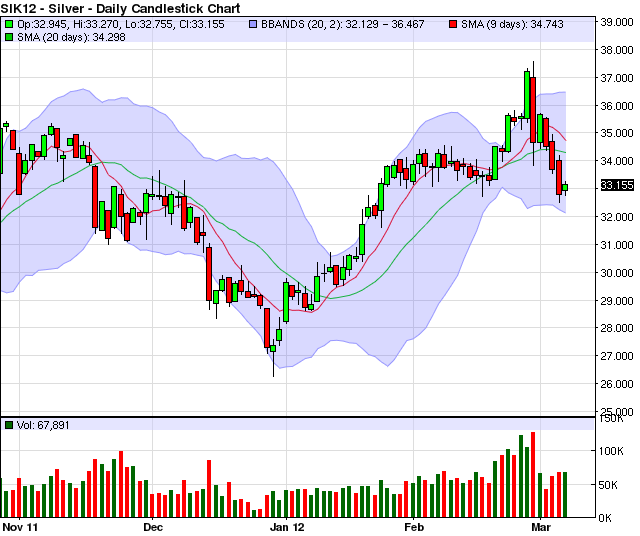 Below is a daily chart on May Silver Futures that may help to explain what I previously explained above. Technically, this daily chart really shows how the market went from a SUPER-TREND higher back on February 28th, the day before the Chairman's Q and A. I call this a SUPER-TREND higher because the 9 day SIMPLE MOVING AVERAGE had crossed over the 20 day SIMPLE MOVING AVERAGE back on about February 23th. At that point the 9 day SMA was above the 20 day SMA, both SMA's where pointing upward on sharp angles, and the Silver market was well above both, this in my opinion is a strong bullish trend. Then the collapse occurred when the market went from a high of 37.58 per ounce on February 29th early in the a.m. before the fed's Q and A to a low of $32.49 per ounce on March 6th. Now we are looking at a scenario on this daily chart were the market has fallen below both the 9 and the 20 day SMA's and both SMA"s are starting to curl and point lower. The trend could be, in my opinion, be in the process of changing to a SUPER-TREND down! Stay tuned futures move fast, especially Comex Silver and that's why I like to trade options. Technically, the weekly chart on Comex Silver tells quite a different story in that the market is not in a SUPER-TREND up, but according to my technicals and in my opinion the trend is still up and holding support even after the fall-out. The 9 period SIMPLE MOVING AVERAGE crossed up and over the 20 period SIMPLE MOVING AVERAGE in the week of February 27th. Now the 9 period SMA is pointing up on a nice upward angle and the 20 is not as strong although is pushing from sideways to upward and one good up day in Comex Silver will curl that 20 period SMA up sharper and push the Silver Market above both SMA's putting the market into a SUPER-TREND up. 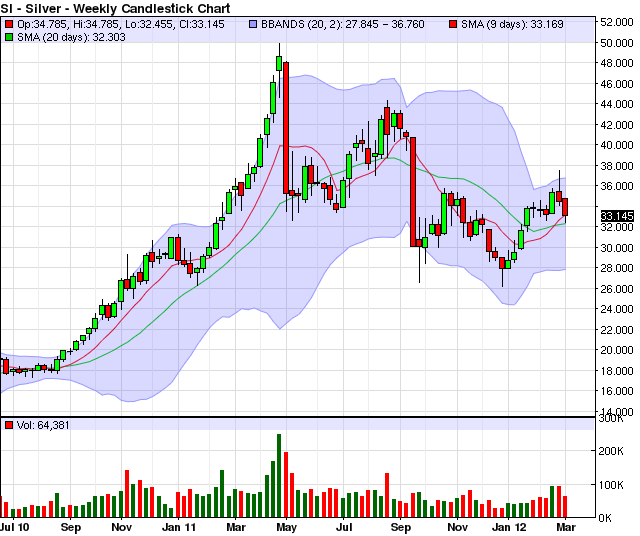 But also remember that the trend is still up in Silver on this weekly chart , it's just not a SUPER-TREND up. In order to see the SUPER-TREND up on this weekly chart we will have to have both the 9 and the 20 period SMA's pointing up on good angles AND the Silver market trading above both. Remember when trading option positions that go out 45-60-90-120 days until expiry, weekly charts are very important in my opinion. Also notice Comex Silver is holding at the 20 period moving average that is pointing upward and, in my opinion, that's why the trend is up. Holding here in my opinion is critical for Silver to move higher. 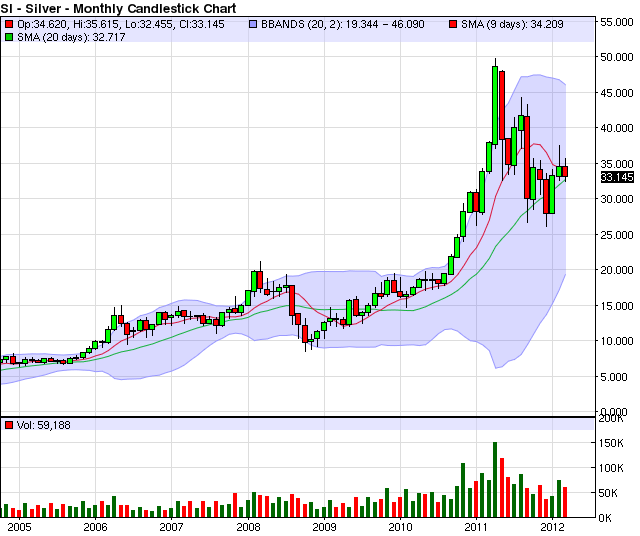 Technically on this monthly chart, in my opinion and according to my technical indicators I see the trend up on this weekly chart in Comex Silver. The reason for this is primarily because of the 20 period SIMPLE MOVING AVERAGE (green line) which is pointing up on a sharp angle and the Comex Silver market is trading at or above this indicator. Now the 9 period SMA is pointing down which is bearish so this monthly Silver chart is giving me some mixed signals, but the fact that the 20 period SMA is pointing up and the market is holding at or above that support area, I like it to hold and head higher and then the 9 period SMA could potentially come around.